Seafarers may submit the application personally in the office or send it by email using the company form Pers 21 – Application for Sea Staff Employment which is available on the main Sea Vacancies page. The company doesn’t employ any person under the age of 18. Received CVs of applicants will be entered into an internal database. Applications will be held on file for a period of 6 months. If you wish us to hold your application please update your cv and re-send before the 6 months expires otherwise due to the number of applications it may be deleted from the system. Personal details of all seafarers are kept confidential with due regards to the right to privacy of the seafarer. advertisement will be placed on this website or on the Portal Morski website. As a minimum standard, all seafarers are to be certificated in accordance with the STCW and appropriate Flag State requirements. To work on Ro-Pax vessels you are required to hold basic safety training courses as per STCW 78 as amended (Personal Survival Techniques, Fire Prevention & Fire-fighting, Elementary First Aid, Personal Safety & Social Responsibilities) and additionally as a minimum compulsory course for Ro-Pax vessels – Crowd Control & Service to Passengers) – please see ﻿﻿﻿﻿﻿minimum additional requirements﻿﻿﻿﻿﻿ for certain ranks. medical practitioner in accordance with ILO, STCW or MLC 2006 Convention, please click the link to approved doctors list (*). * - At present there is a certificate error on the Polish Marine Website but the approved doctors list can still be displayed if you press continue. All Cooks must be certified in accordance with MLC 2006, applicable national and/or Flag State regulations. about any additional requirements. Costs of passport, medical certificate, national (Polish) Seaman's Book, compulsory STCW certificates appropriate for the rank remain at seafarer's costs. Previous ferry or passenger vessel experience will be advantageous. All candidates must be resident in an EU country. interviewed in English to check their English level prior to their cv being forwarded to Matrix Ship Management for approval. 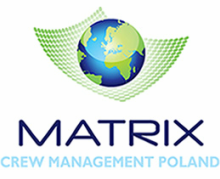 Proposed candidates will be accepted or rejected by Matrix Ship Management within a reasonable time. Only accepted candidates will be informed. Selected candidates will be asked to complete TOSE and Marlins tests. The pass mark is set at a pre-determined level in line with the demands of the rank. If spoken level of English is satisfactory then the result of a Marlins test from the previous employer may be acceptable. obtained, complete the applications for Flag Endorsements, Flag Seaman’s books etc. if required (this cost for Flag required certificates will be covered by Matrix). company policies, particular conditions of the Owner. The candidate will be given adequate time to examine their contract before and after they sign and they will receive a copy of the contract. The Appointment Letter will be signed by both, the seafarer and Matrix Crew Management staff as the agent for and on behalf of the Owner of the vessel. The Letter of Attorney is posted at the Agency. Seafarers will be trained and instructed on board the vessel in accordance to Matrix Quality Safety & Environmental Management System prior taking the duties. All employed seafarers are provided with adequate uniform and/or protective clothing on board the vessels.